With Seville Cabinetry, you can create cabinetry to meet your needs and enhance your style. Choose a cherry, hard maple, hickory, red oak or other wood and finish it with one of Seville’s standard finishes. Or request a custom color match from an existing finish you may already have in your home found elsewhere. Seville’s door styles feature a wide selection of profiles, along with moldings, accessories, and options to give you the flexibility to create the look, feel and functionally you desire. You can create a simple one-drawer storage area in your mudroom, or a library full of custom cabinetry. With Seville’s experience in custom manufacturing, you can be assured your cabinetry will offer the finest quality and craftsmanship. At our state-of-the-art facility we will craft each cabinet with low tolerances and a high quality finish to bring you cabinetry for a lifetime. From the finest quality woods, to premier craftsmanship and quality finishes … custom cabinetry crafted by Seville is appreciated for its quality, beauty and reliability. Seville ’s state-of-the-art manufacturing facilities are located in Northeastern Wisconsin where quality workmanship is a way of life. Here, we transform select hardwoods from around the country into quality cabinetry for homes, offices and businesses. Our parent company, Valley Cabinet, Inc., was founded in 1960 as a custom cabinet shop serving the local area with high-end cabinetry. Valley Cabinet enjoyed rapid growth and soon served all of Northeastern Wisconsin. In 1994 a decision was made to offer the Valley Cabinet quality and craftsmanship through a dealership network, and Seville Cabinetry was born. By focusing on quality and high-end craftsmanship, Seville Cabinetry has continued to grow and now has dealerships throughout the Midwest, the Mid-Atlantic and into New England. It is the mission of Seville Cabinetry to deliver the highest value, design, service, and customer satisfaction to our dealers, our dealer’s clients, our suppliers, and our employees by supplying flexible, high quality cabinetry for all areas of the home. This will be accomplished through superior product offering, production techniques, and service to our dealers. Seville Cabinetry will work to improve the environment and quality of life through the implementation of sustainability practices within our business operations and manufacturing practices for the betterment of the environment, our customers, our employees, our neighbors, and our community. The leadership and employees of Seville Cabinetry recognize balancing our manufacturing approach and process to help fulfill the needs of the environment is an important part of what we can do to improve the quality of life for our customers, the environment, and ourselves. Manufacturing of our products has a direct impact on the environment through the consumption of energy and materials we use. Protecting this environment has been added to the chemistry of our business practices and is being adhered to by our leadership and employees, through education and training. To demonstrate this practice, we have developed and implemented a policy that includes planning, training, implementation and review for the things we do today and into the future. Our goal is to show that sustainability makes sense and will add benefits to the products we produce and clients we serve. 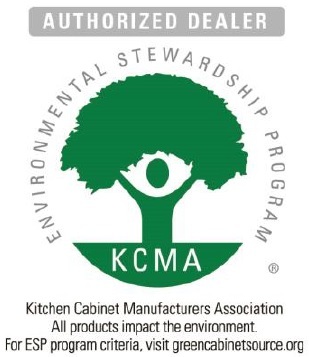 We are proud to take part in the KitchenCabinet Manufacturers Association Environmental Stewardship Program. An industry leading warranty gives peace of mind. Seville Cabinetry warrants to the original retail purchaser of this product from an authorized dealer that the Seville cabinetry purchased will be free from defects in workmanship and material under reasonable use for as long as you own your Seville cabinets. This warranty is not transferable and applies only to the original installation. Upon inspection by Seville Cabinetry, should any defects in material or workmanship be shown to exist in any product manufactured by Seville Cabinetry, Seville Cabinetry, at its option, will elect to repair or replace any product or any part thereof, which proves to be defective. Other products, such as countertops, appliances and/or plumbing fixtures, are not covered. Seville Cabinetry will not be liable for any labor, removal, installation, shipping, freight, or other charges incurred when acting upon this warranty. Seville Cabinetry will not be liable for any damage or errors resulting from or related to the installation, storage, miss-use, abuse, negligence, modification, or use of its product when not done in accordance to product instruction. This warranty does not apply to unfinished cabinetry, normal wear and tear of this product, to the natural or darkening of wood and wood products, or to the natural inherent growth characterizations of, or variations in wood. The effects of exposure to sunlight, extreme temperature, and extreme moisture or dry conditions are not covered by this warranty. Some components used in manufacturing your cabinetry are not manufactured by Seville Cabinetry. (Hinges, drawer guides, etc.) Components of this product not manufactured by Seville Cabinetry will be covered to the extent indicated by the original manufacturer’s warranty. Before requesting a replacement door, the purchaser agrees to allow doors that are warped 1/4″ or less to hang for a complete heating-cooling season. Doors will typically return to their normal flat position once they are allowed to acclimate to temperate and humidity conditions. Cabinets not properly installed will give the appearance of a wrapped door and will not be considered for warranty. To file a claim on this warranty, submit your warranty request along with your proof of purchase to the authorized Seville dealer where you purchased your cabinetry. This warranty applies to product shipped after April 2012.